This bike looks like a stunner...retro looks with nuovo features. It reminds me of the old Thunderbird Sport from the nineties...only better. They even did away with the fake Monobloc throttle body covers! Man that's nice. Triumph really has a nice product line. And a great dealer network, what a concept!! Just turned my Tiger over 70 K It's been rock solid! Is the seat just a fraction under done..? I am really impressed with the new triumphs. They are building some gorgeous bikes! Nice! I like everything except the foot controls. What wrong with the foot controls, Shorty? A bit too sporting for your taste? I never really noticed that until you mentioned it. That Triumph works for me also! Would have no issues riding and owning one! 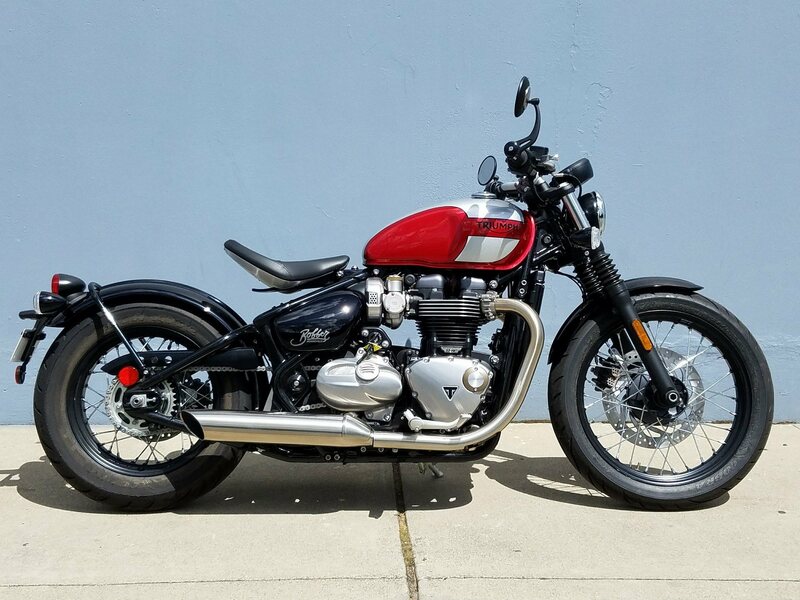 Is this a tarted up Thruxton? It is a de tarted Thruxton. You do not get the high zoot suspension on this model. Same spec engine. Less aggressive riding position. Yes, Rick, the pegs are too far back for me. Bummer. Nice sled otherwise. I like Triumph, but my Guzzi dealer is half the distance and I can manage the 90 mile backroad ride to him. I just wish that it came with a tank that was bigger than 14 litres. It might be OK for the US and Europe, but here in Oz 14 litres is just too little to get between a lot of places with any safety margin. If it is 14 litres (3.0imp/3.7US gallons) then it would not be adequate for me in the UK also. These small tanks are a pain if you ride regularly, being constantly at the fuel station is not my idea of fun. They're right were they should be, albeit, a little high. Some lowering pegs from Knight Design, or one of the others posted on the various V7 threads ought to take care of it. Am considering moving up model from my V7 III for better suspension and a bit more power. 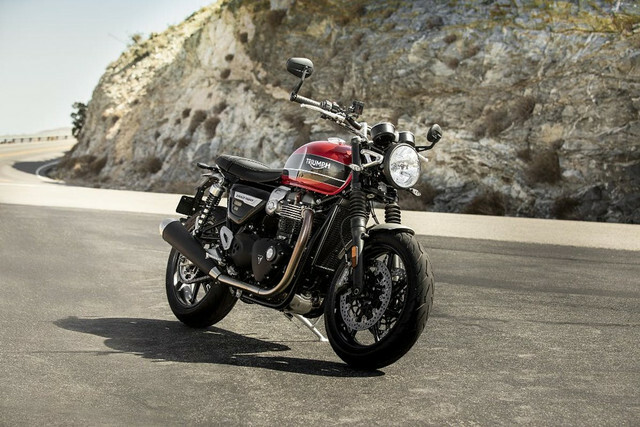 I have my eye on the V85 but this new Speed Twin could sway me to Triumph. Don't ride long distance that often so the smaller tank doesn't really bother me and the standard/sporty control layout is fine. It will come down to availability, ride and cost of the two bikes. It's going to be an interesting spring, even more so if MG announces a sportier version of the V85. Or, a set of controls from the Bonnie Bobber. I wonder if it would be that simple. The controls attach to the frame or the engine cases? And are the cases the same between the Thruxton/Speed Twin and the Bobber? After examining the Bobber close up (Jenn liked it, and it was in consideration for a brief moment) I noticed it has the mounting points for passenger pegs (like the ones that are on the SpeedMaster). It just has no mounting point for a passenger SEAT. And the Speedmaster kinda ugly-fies the Bobber. But I do wonder if you can change the seating position on the Speed Twin. No matter, we're a lot more likely to wind up with a Street Twin. I've ridden over 10,000 feet elevation and some steep grades and never felt like I couldn't maintain speed on the V7III. I did upgrade the front and rear suspension and now have the perfect bike to complement my other ride. Pretty bike, I just don't like that ridding position though. Out come flood boards on her so I can get my feet a little more foreword and I'd like to ride one. The fact that this new model has mag wheels instead of spokes is very savvy on Triumphs part. Many of us don’t want spokes. So if many of you don't want spokes, what do the others want..? The rest don't know any better. That's a bit disconcerting Kev. I've had about 40 bikes and half of them had cast wheels, what bracket does that leave me in ? A higher tax bracket Huzo. You speak truly wise one...!